A B C’s: Alzheimer’s, Blogging, Cancer? I have been missing in action again. Well, not really missing, but absent from blogging. It was not intentional. I just need sleep, I think. Since NaNoWriMo ended I have been trying to do a little catch up on other things. This is my week home from caregiving (Alzheimer’s) and even though I have had some time, I’m finding it hard to accomplish much extra. My blogging has suffered (again! ), and for that I apologize to you, my readers. My stress level is climbing and I’m quite tired, but Christmas is coming and I have to get busy! The added stress is that recently my dear husband was diagnosed with level 2 melanoma, skin cancer. (I had to pause before typing out that hated word.) My husband told me he doesn’t care if I talk about it here; he says many people know anyway, and it is what it is and will likely become obvious. I am sharing this information in the hope that Believers will pray for him. He has had one minor surgery, and on December 18 he will be undergoing a more involved one. After that one and before doing reconstructive surgery the surgeon will be searching for lymph nodes in order to remove some for testing. This all will happen within six hours on the same day. Test results are to come back four weeks later. That happens to be my week at Dad’s, so I am working out details to have someone there in my place while I am with my husband for two days. Once he is doing okay then I’m back to Dad’s for the rest of the week. Plus, it’s going to be crazy trying to get everything ready for Christmas during all this. We have been attempting to get our shopping completed in preparation, and I got my ‘away’ gifts all mailed yesterday. A fun thing for me is that on Saturday I met a new author who is a bit of a celebrity. She signed her book for me and after I finish reading it I will be doing a review here .. after the others I have lined up. I cannot end this post without saying that in the long line of people waiting for the signing of books on Saturday, three people behind me was none other than the lovely and talented author Laura Best! Remember my review of her book Bitter, Sweet and our interview? We had a chance to chat a little which was enjoyable for me, with comedy added since her husband was her “professional photographer” and quite a kidder. I suppose most of this reads like a “woe is me” post. Admittedly, I’m feeling rather blue right now, but after a good sleep things should look a little better. Truly, I rely on the Lord although it may not seem like it right now. My human nature is to look at the situation and then have to remind myself to look to the One who knows all. One of my life verses is Romans 2:28: And we know that all things work together for good to those who love God, to those who are the called according to His purpose. Monday was an interesting day, not at all what I had anticipated. As the day got closer I became more anxious. My root canal was scheduled for the morning at 11:30. To say I was nervous would be a slight exaggeration. I tried to be calm; I took a 400 mg Advil suggested for the jaw pain I get during dental appointments; I prayed to be calm. Soon I remembered the herbal remedy I occasionally used years ago when I was singing in a group. 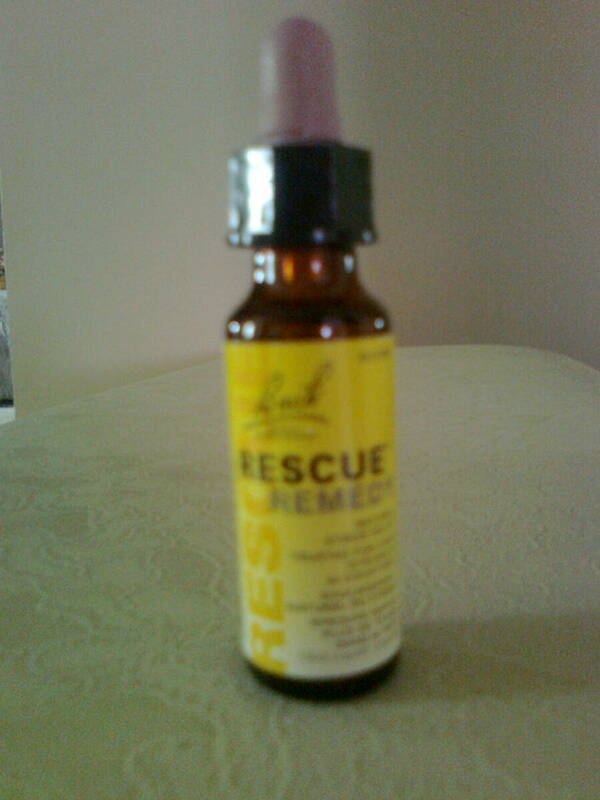 My jangled nerves would mess me up so my voice teacher recommended Rescue Remedy, which worked amazingly well. A quick dash to the health food store and I had a new little 10 ml bottle of stress relief. A few drops on my tongue, and before I arrived at the dental office I felt much more relaxed. I had been experiencing tooth pain for a few weeks, but tolerated the discomfort since I had a regularly scheduled dental appointment anyway. When the appointment came around in late March, it was determined a root canal may be needed. Oh dread! My dentist sent me on to the specialist who does only root canals, and who – I was told – is very good, won’t do anything not required, and is gentle and careful. Okay, that sounded acceptable, so I went along to him a week later. After x-rays and checking the problem, he set up an appointment for me to have a root canal three weeks later, April 23. Also, because of my likely jaw pain he could divide the procedure into two parts if it were to become too difficult for me during the usual 1.5 hours to completion. I arrived for the procedure but this time he found no reason to do the root canal! He said somehow everything had settled down and he suggested we wait to see if the problem flares up again. Imagine that! I m a g i n e that. I’m thanking the Lord for this turn of events. If I do end up having to go through the procedure later, the time will be right. Unless you think that trying to write when nothing is forming in your mind is like a toothache nagging at you and nagging at you. You need a rescue. You need to go down deep and find the words, the source of the irritation. You need to tunnel into those deeply hidden, elusive thoughts and permit your true ‘writerly’ genius to excel. You need … a mental root canal! Too over-the-top? Sorry. Let me try that again. there seems to be nothing at all … write. WRITE to discover what is concealed there. Write more and continue to write. Gee, I wish I’d said that … oh, I did! Now to take my own advice – advice given to me, and which I am now passing on to you. What is your best advice for that absence of creativity, or for the seemingly wordless Muse that won’t quit nagging?